NOW-ID IS ABLE TO PROVIDE A NUMBER OF DIFFERENT RESIDENCIES, CUSTOMIZED TO YOU. The below descriptions outline a number of options that can be offered singularly or in combination. Our offerings range from classes and workshops in dance and design to re-staging or adapting an original works or new performances crafted specifically for a venue in your community. You may choose to work solely with artistic director Charlotte Boye-Christensen or with a team of collaborators we pull from our network in collusion with yours. Please contact us to discuss how we can best work with you to create an inspiring performance or education event for your community. Premiering in 2018, A Tonal Caress was staged at Utah Museum of Fine Arts in Salt Lake City and was a collaboration with V.Project in Salt Lake City and Arts Access Victoria in Melbourne, Australia. 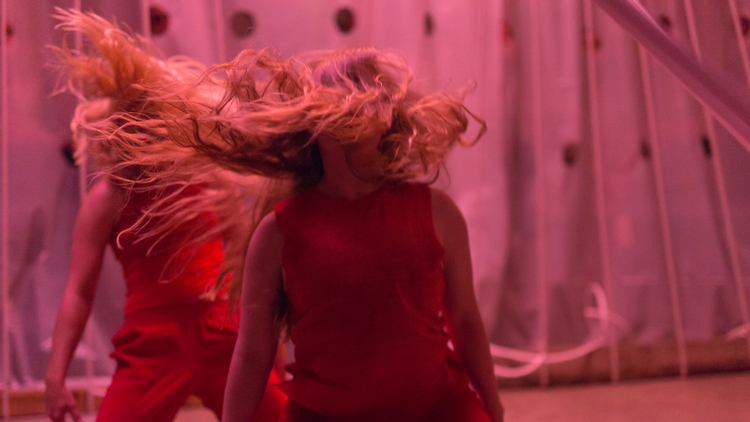 The production includes 3 contemporary dancers, 1 deaf poet/performer, 2 Auslan sign-language interpreters, 1 choreographer, 1 set designer, 1 sound engineer, 1 lighting designer and 6 performance artists. We would love to adapt this piece in which we aim to seek a deep communicative connection for both deaf and hearing audience and communities to a space or venue in your community. Premiering in 2016, It's Not Cracker was staged at Utah Museum of Contemporary Art in Salt Lake City. It includes 2 contemporary dancers, 1 performance artist, 7 street dancers, 1 choreographer, 1 set designer, 1 DJ and 1 lighting designer. We would love to adapt this piece which evokes the original Nutcracker in familiarity and seasonality, but is different, contemporary, unique, fun, diverse and serious too to a space or venue in your community. Premiering at The Marriott Center for Dance (A proscenium stage) in Salt Lake City in 2016. EXODUS was co-produced by NOW-ID and the Figura Ensemble of Copenhagen, Denmark. This production was performed over several nights in Salt Lake City before touring overseas to Denmark, where it was performed at the Copenhagen Opera Festival and later at Fyn's Opera in Odense, Denmark. EXODUS focused on the human necessity to move, whether because of persecution, poverty, religious beliefs or opportunity/adventure. EXODUS is a 60-minute long multi-disciplinary, multi-cultural work, involving 3 dancers, 3 musicians, 2 opera singers, a director, a choreographer, a lighting designer and a set designer. Premiering in 2015, NOWHERE was staged in a concert hall with live music (organ and double bass), and includes 4 dancers, 1 artist, two musicians, lighting designer, set designer and choreographer. We would love to adapt this study of place to a space or venue in your community and may bring our own team, or consider integrating musicians or other artists from yours. > Please contact us at contact@now-id.com for price estimates. Premiering in 2014, FEAST was staged at the Great Saltair in Utah with live music (double bass), and includes 3 dancers, 2 actors, 1 musician, lighting designer, set designer and choreographer. We toured an augmented version of Feast - FEAST/KANSAS to the Kansas Dance Festival in November of 2014. Premiering in 2013, The Wedding was staged at the Masonic Temple in Salt Lake City and includes 4 dancers, 4 performance artists, 1 artist, 1 set designer, lighting designer and choreographer. Similar to FEAST and Nowhere, The Wedding can be adapted to a space or venue in your community. A New Performance residency will involve the following: Charlotte Boye-Christensen with the participation of company dancers and architect Nathan Webster will work with up to 50 participants to create a full-length new dance work as a stand-alone piece or create it around the company’s performances. Participants will generate material under the direction of NOW-ID and may potentially perform alongside the company dancers in the work. The scale and schedule of the residency will be decided on in dialogue with the partner organization but will culminate in the creation of a new dance piece in a venue or site-specific location. A choreography residency will involve Charlotte Boye-Christensen coming in ahead of the company and creating a new work on the students/dancers. A further addition that has been successfully offered in the past may include integrating the student work into a NOW-ID performance. Charlotte has choreographed Nationally and Internationally on ballet companies as well as contemporary dance companies, various Conservatories, Universities and other arts organizations. These classes are based in Release, they will be technically challenging and reflect the idiosyncratic and dynamic movement style of Charlotte Boye-Christensen. Levels include Beginning, Intermediate, Advanced, and Professional. These classes will be exploratory and look at space as an additional collaborator in the process. They will also involve concept and formalistic research. And look at effort and motion and how it pertains to concept. “…the gestural vocabulary she has developed in combination with her explosive movement style tells a unique story within each piece." "Charlotte Boye-Christensen has a choreographic Knack that transcends medium...Rhythmic finesse, whimsy and a gift for conciseness make Christensen's images delightfully unique...wherever they are seen." "Working with Charlotte Boye-Christensen during her creation of Feast was innovation at its best. This multidisciplinary experience involved the percussion program, the entire dance program and her own, NOW company dancers. Billed as a 'banquet for the senses", Feast exemplified the meaning of contemporary performance. The process was organic, intelligent and exhilarating. The dancers performed their personal best, inspired by the work, the collaboration and the professionalism of sharing the stage with the NOW dancers, themselves extraordinary artists. Charlotte approaches choreography with a specific voice she has developed during her career. Invention, originality and current are the descriptions of her process that immediately come to mind. Collaboration was easy, patient and visionary. We all grew from this remarkable 'dinner date' and look forward to a repeat effort in our near future." Our residency with Charlotte was excellent in every way! The majority of students in the dance program at the University of Richmond also have majors and minors in other academic disciplines and Charlotte’s way of engaging them on every level was impressive! Certainly they were challenged physically, but Charlotte’s choreography and approach to the work helped the students to grow artistically, emotionally, and intellectually as well. Charlotte expects a great deal from her dancers including specificity in movement and intention. The result is that we all have had an exceptional experience that we will not soon forget! The University of Richmond’s Department of Theatre and Dance presented Charlotte’s original work, “Unsettled” at the Mid-Atlantic conference of the American College Dance Association at West Virginia University and the work was selected to appear in the conference-closing gala concert. Charlotte’s residency provided a unique and very valuable component to our student’s education. We look forward to working with Charlotte again! Video above was created in connection with a residency at TCU School for Classical and Contemporary Dance, Fort Worth, Texas, 2017. Based around our “Space as Collaborator” workshop, we bring designers together to work with choreographers and dancers on site-specific projects and mentor them through the process. In this process we are looking at the history of the site, marketing and stage design elements, different elements of space, such as borrowed scenery, body/scale, audience, and possibilities for technology to be added, integrating an event with other local businesses in the area, etc. The workshop is meant to create an open format for exploration and collaboration, and may include showings in process and of the ‘finished’ works over the course of the week. "I was very excited about the collaboration aspect of this workshop and I felt that I had the chance to work with phenomenal artists who were respectful and full of ideas. It provided me a safe environment to experiment with aspects of choreography and site specific work that I have never tried previously. It was a place I could step out of my comfort zone knowing I would be encouraged and supported whether it was successful or not. It now gives me material and knowledge to carry over into the next steps of my career as a dance artist." "This was such a cool workshop! It far surpassed my expectations. My favorite part was probably getting the chance to work with such talented designers since that was a completely novel experience for me." 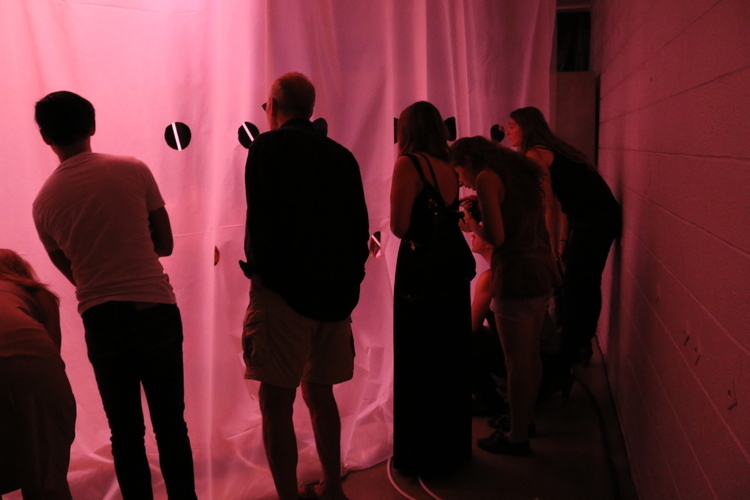 We can provide symposiums on site-specific and interdisciplinary performances as well as on design and criticism. Fees for residencies are subject to negotiation.